For more than 35 years, Enabling Devices has provided an array of equipment to improve the quality of life for children and adults with disabling conditions. More recently, the company contacted Smart Products to improve the function of their Musical Bubble Tube. 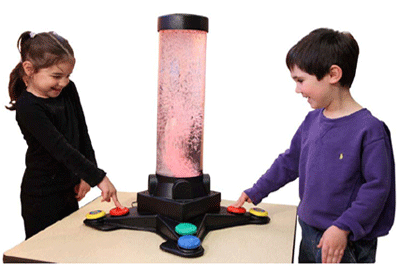 The Musical Bubble Tube (pictured) is used in sensory spaces as a therapy product to help children and adults with disabilities adapt to environmental stimuli. Designed to provide multi-sensory feedback and encourage visual attention, the tube incorporates music, colors, and bubbles to engage with users. Smart Products' Model #304/304 Modular Check Valve (shown installed) plays an integral role within this device by controlling the air flow that pushes water through a filter and into the tube to create the bubbles. A key feature of the tube's design is the adjustable bubble speed option. The valve also stops the back flow of water from going into the air pump. 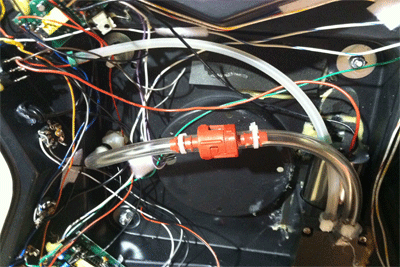 For this particular device, precise flow control = optimal user control over the bubbles to help ensure they have a successful therapy experience. To view a video of how this device works or learn more, click here.